You remember the Switch of Mystery from earlier this week, right? I believe I have solved the mystery. And hopefully figured out everything I need to know about operating the heat and hot water here in the process. Turn on the central heating power switch (this switch will override everything). Set the thermostat to the temperature we’d like the house (or at least the living room, since that’s where it lives). Set the timer on the boiler for the hours we’d like the heating to turn on/off (but remember, without the switch on, the timer is meaningless). Set the individual radiators to the level of power we’d like them to crank heat through at (1-6) to control the temperature in each of the 11 rooms/areas the radiators are installed. So now we are warm. But what about hot water? 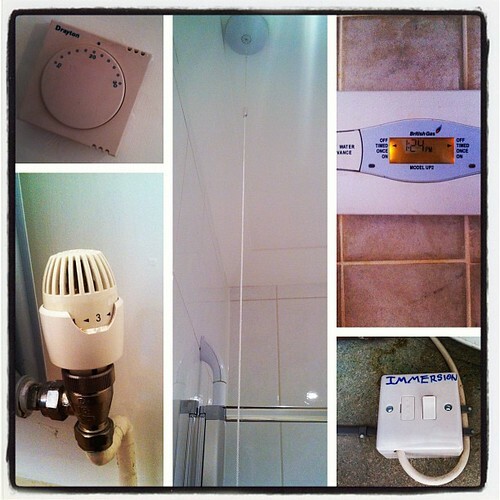 I had figured out enough to know that the same timer controlling the central heat also controls the hot water. But I was still ending up with very short or very cold showers, even when the hot water “advance” (meaning the small boiler keeps the water inside hot, rather than heating on demand) was on. Enter: the backup immersion heater. This lives in a closet on the top floor, is the size North Americans would consider “standard” for a hot-water tank, and is only on when the “immersion” switch in the same closet is on. As far as I can tell, it is not on a timer, or otherwise controlled by any other switch (I could be wrong). I’ve been warned that running this on a continuous basis could get expensive, so depending on how our energy bills stack up, I may be getting used to shorter showers so we can turn it off if we don’t have a house full of guests. But wait, that is still a bit too simple. Just to be sure I can’t enjoy my extra hot water without being explicitly aware I’m doing so, each of the bathrooms also has a pull-cord on the ceiling (that turns on an extra bathroom light, natch) connected to the immersion hot-water tank to signal to the pipe-fairies that it’s A-OK for me to enjoy a shower that’s hot all the way through. Forget to pull the cord, forget about the extra hot water. But I think (hope, pray) that’s actually all of it. Again, thinking about it objectively, it’s actually nice to have so much control over where, when and how much heat and hot water one uses. Especially in a country where fuel and energy costs are quite high. It did take a while to figure out thanks to the EEDD factor, but it’s another thing I suspect I’ll come to miss whenever we decide it’s time to move on. I can totally relate. When I lived in Manchester I did not know how to operate half the things there. And I think what happened with me and England was that I felt that it was too much work and I decided my life was much better and easier in Canada than in the UK. But this (the switches and powering stuff) was probably the life changer. If only I had been a little bit more patient! The British love of ugly, unreliable radiators is baffling to me. They’re a crappy way to heat your house, and incredibly finicky. In truth, the entire British relationship to hot and cold is strangely neurotic: obsessiveness about the temperature of tea, separate taps for hot and cold water, and so forth.